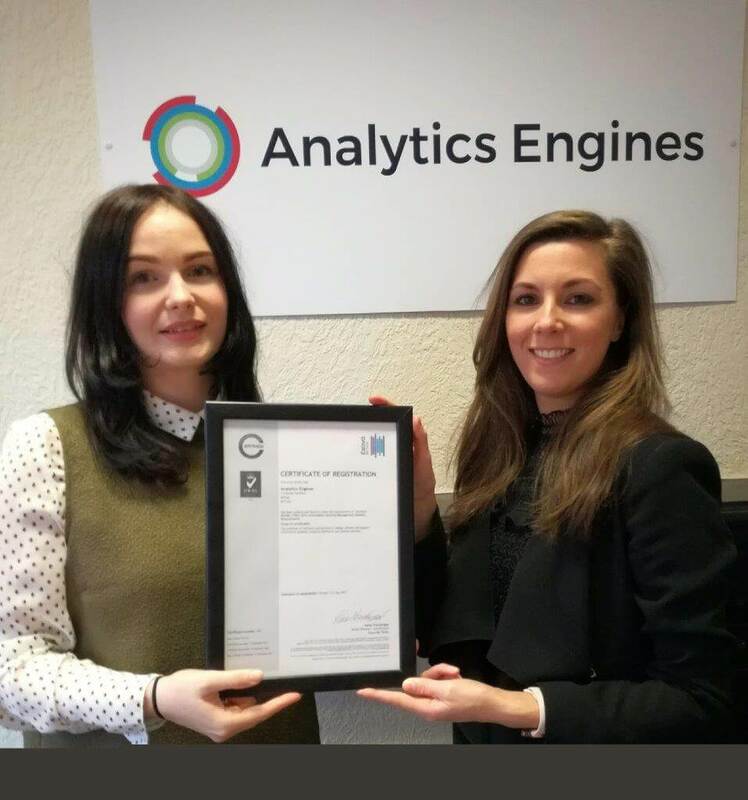 Analytics Engines are delighted to announce that we have officially been certified to the ISO 27001 Information Security standard. The standard is a globally recognised certification, formally known as ISO/IEC 27001:2005), a specification for an information security management system (ISMS). An ISMS is a framework of policies and procedures that includes all legal, physical and technical controls involved in an organisation’s information risk management processes. Analytics Engines are totally committed to the continual improvement of the system in line with regulations and also for the security of our people, processes and technology. We take Information Security compliance seriously and keeping information assets secure are paramount to what we do here. We don’t want to take any risks where our customers data is concerned. The ISO 27001 standard gives us and our customers and business partners the assurance and confidence that we are processing valuable data in a managed and structured way that mitigates as much of the security risk as possible. Anyone who has had the job of managing and implementing an ISO system will know the pain involved in getting the system up and running but will also be aware of the plethora of benefits that the investment brings. We engaged with local Management Systems Consultancy, Quadra in the implementation process which helped us develop a robust ISO system and provide expert knowledge in the area of Information Security. It is so much more than just a certificate on the wall and we are beginning to find out why as we navigate through the world of compliance. GDPR is on the horizon and we are ready for it!